Don't even ask why someone would want an $86,000 Jeep Grand Cherokee with a 707-horsepower supercharged V8 engine. There is no rational reason for such a machine to exist. It answers no pressing need. It does not leave the Earth a better place for having driven over it. Land Rover, Porsche and Mercedes, among others, all make performance SUVs. They are, legitimately, a thing. Maybe a dumb thing, but a thing. That's because everybody loves SUVs and some people still love performance. Or at least bragging about performance. And some of these SUVs, the Porsche Macan for instance, are marvelous. When it comes to the Jeep Grand Cherokee Trackhawk, I was skeptical, but it largely won me over. I loved how easy it was to live with 707 horsepower. Normally, this sort of outrageous power comes in a package, like an exotic European sports car, that requires great care in handling. 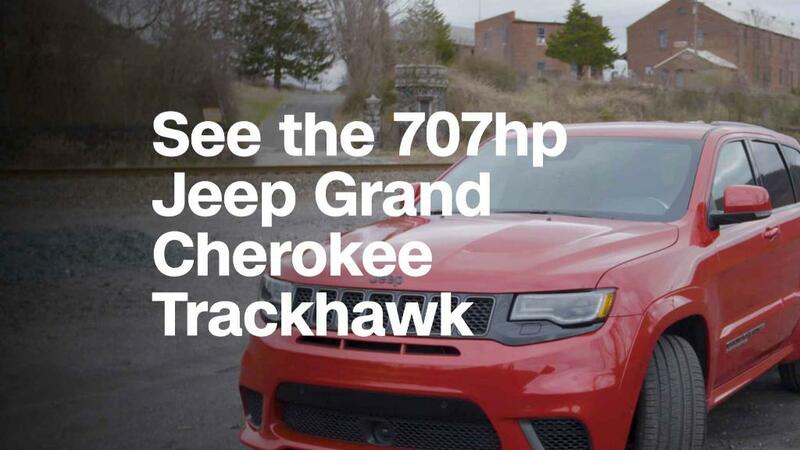 The Trackhawk isn't up for real Jeep-type off-roading. But potholes or bumping over the occasional curb ... no worries there. It is, still basically a Jeep Grand Cherokee with a huge engine upgrade. There is one thing we need to get to: Gasoline. Lots of it. There was a time when the Trackhawk's EPA estimated fuel economy of 11 miles a gallon in the city and 17 on the highway would have seemed OK. Around that time, cigarettes on elevators and hard liquor at lunch were also considered acceptable. One could make the argument that, considering its horsepower, the Trackhawk's V8 is actually extremely efficient. Absolutely. And TGI Friday's Toasted S'mores Extreme Shake is a diet drink considering that... Oh, come on. 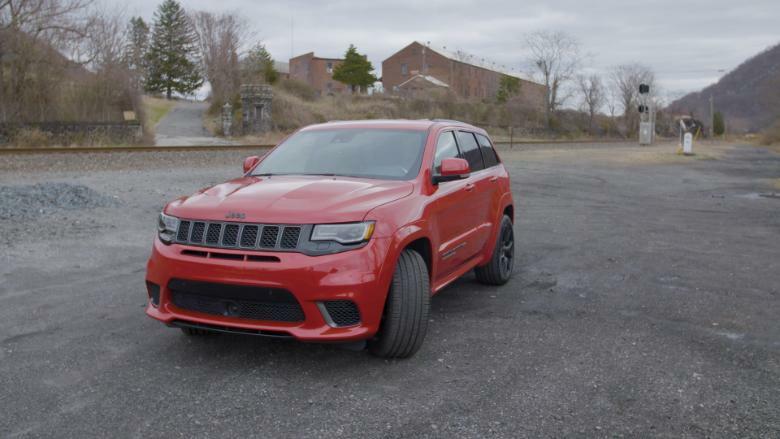 The Jeep Grand Cherokee Trackhawk doesn't look all that different from the regular version. It's the engine sound that gives it away. But here's what Trackhawk is. It's fast. With the help of "Launch Mode," it can go from zero-to-60 miles an hour in 3.5 seconds, according to Fiat Chrysler Automobiles (FIADF). I do not disbelieve them. Even with just a simple push on the gas pedal it accelerates as if the car up ahead were its next meal. The engine makes a vicious snarl overlaid by the climbing whirr of the supercharger pulling in roomfuls of air. It's a terrific experience and it's hard to resist the temptation to use every opportunity for a howling entrance onto the interstate. Despite not having been completely re-engineered in nearly forever in auto industry terms -- this Jeep still carries Daimler (DDAIF) DNA from Chrysler's last failed marriage -- the basic Grand Cherokee is still a fundamentally good product. It takes a beating better than most crossovers and still drives nicely on the road. The Trackhawk's lower ride and bigger brakes are also clues to what's under the hood. The Trackhawk, with performance suspension, performance brakes and all, is no punishing brute in daily asphalt-coated traffic. Drive it fast into a curve and, well, it's a Jeep. It's tall. It's heavy. But it does surprisingly well. The tires extend farther out to the sides for greater stability. In Sport and Track modes, the suspension stiffens for better handling but it still remains fairly comfortable. 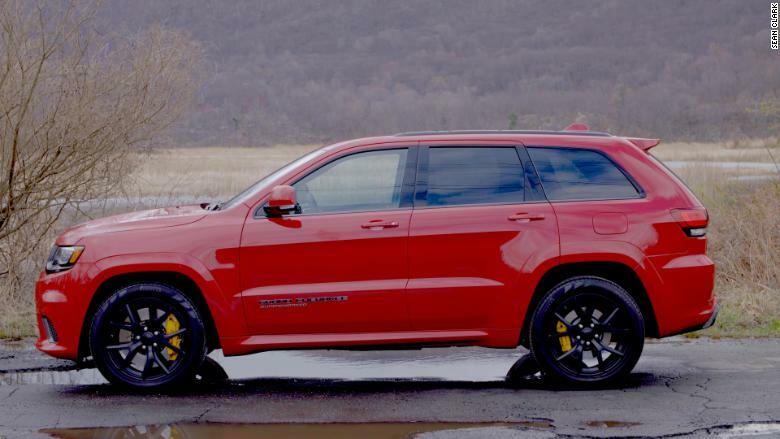 You might object to the Grand Cherokee Trackhawk's very existence. You might decry the sort of person who would consider, even for a moment, buying such a wasteful thing. And you might be right. But, for a moment, let us take it as it is compared to similar, but costlier, baubles one could buy from any of the European luxury carmakers. Seen that way, the Trackhawk looks pretty good.